Plant Sale Free and Open to all! Fall is one of the best times of year to plant— the soil is still warm enough to allow root systems to establish and cooler temperatures reduce your need to water. 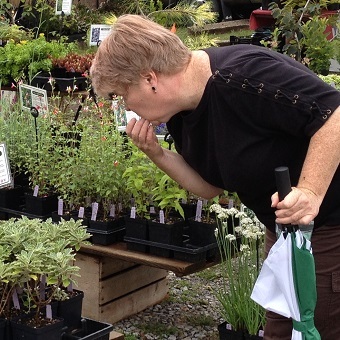 Get a head start on your fall plant-buying—and enjoy one-stop shopping-- at HPS/MAG’s annual Fall Gardeners Market. The Market features 20 different vendors, including sellers of succulents, native plants, fancy weeds, trees and shrubs, and tons of unique specimens you won’t find elsewhere. Planters, tools and hypertufa are also for sale. In addition, we offer special pricing on nitrile Gardening Gloves, a Raffle and two Food Trucks with delicious fare. This year, the Market is being held at a new location, Temple University Ambler in Ambler, PA. This is your chance to visit the historic and very diverse Ambler Arboretum, with a free guided tour scheduled for 11 AM led by Arboretum staff, or on your own schedule with a self-guided map. At our Membership Booth, nonmembers are invited to chat about HPS/MAG with longtime members, and visitors may join or renew their membership. Savvy shoppers bring baskets or a wagon to carry their purchases, and volunteers are on hand to direct parking and load cars. A plant park is available to corral your purchases while you continue to shop. Vendors that have signed up to participate this year already! Cairnsgrove Gardens & Apiary-Raw local honey, beeswax handcream/lotion bars, hand all natural soaps. Collins Nursery-Native nursery of perennials, shrubs, trees. Hypertufa troughs and pots. Cymron Cottage Nursery-Perennials and small shrubs. Garden Vision Epimedium-Epimedium and other hard to find shade perennials. Gettysburg Gardens-Woody and herbaceous perennials, mainly native. Putnam Hill Nursery-Perennials native and non. Ground covers and a variety of hard to find plants. Rooster Ridge Pitcher Plants-Pitcher plants and native specie seedlings. Ryeland Gardens-Perennials, interesting shrubs, unusual conifers and steel planters. Shannon's Nursery-Native perennials, ferns, shrubs and trees. Steven Kristoph Nursery-Great selection of woody shrubs, trees, perennials and etc. Triple Oaks Nursery-Plants and horticulture items. Yellow Springs Farm Native Plant Nursery-Conifers and other perennials. Wolf Run Nursery-Conifers and other perennials. To apply to be a food vendor, click here.